"Why would a child run away from anything that he/she is familiar with - parents, home,friends, and surroundings? But pushed to the wall, many try to escape what must be a living nightmare, an alcoholic father, an abusive step mother, a sexually predatory relative, grinding poverty or the lure of bright city lights offered up by seemingly innocent traffickers – it's a hope for a better life that makes them leave home”. Since inception, Salaam Baalak Trust has been a constant source of helping such children realize their rights and feel safe in this world. the trust has toiled tirelessly and garnered immense goodwill allowing it to support over 90,000 children in need. Today the trust has 12 contact points, 7 shelter homes. 12000 of these children go to regular schools and 18000 have been reunited with their families. Many of these children are rescued by the Child line (a dedicated help line manned 24 x7) staff upon getting a phone call or after surveys done in child labor intensive areas with the help of the police. 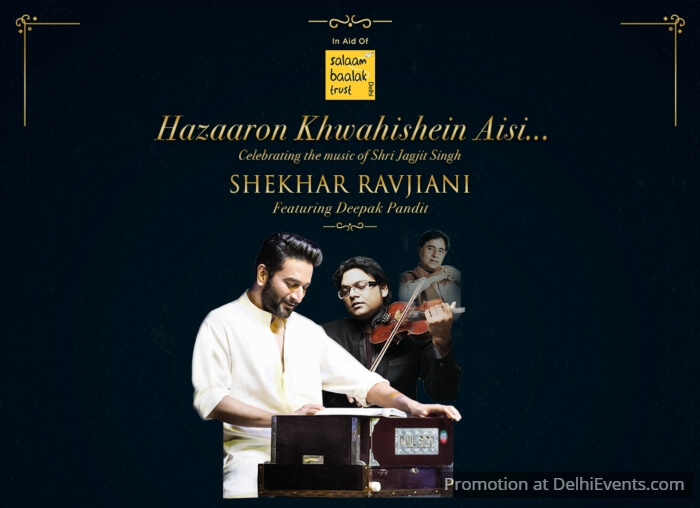 After successful sold out concerts in Jakarta, Kuala Lumpur, Hong Kong, Dubai and the Jaipur Literature Festival, Salaam Baalak Trust presents ‘Hazaaron Khwahishein Aisi' in Delhi as their first ticketed concert in India. "30 years is a huge milestone for us. Getting here would have been impossible without the generosity of thousands of well-wishers and donors over the decades. And while we look back on our journey with immense satisfaction, we recognise that much remains to be done. We hope this event will help generate awareness and funds to continue our work with children. As they say, 'it takes a big heart to shape a little mind’. We call on the many big hearts in our world to join us on our onward journey." says Tanya Alag, Head, Resource Mobilization.